Chris Smith is congratulated by Jack Brivio. Picture by John Lines. The Hornets won their penultimate away game in Kent this afternoon, beating Herne Bay 3-2 to ensure they cannot now finish outside of the top five. Goals from Chris Smith, Lee Harding and Kieran Lavery secured the three points that now means that sixth-placed VCD Athletic - who beat East Grinstead 5-4 - cannot finish above them. Attentions will now turn to capturing as many points in their remaining two fixtures from the points-to-game ratio and also securing home advantage in the play-offs. The visitors led after just seven minutes when Lee Harding floated a corner into the back post and Joe Shelley headed it back across goal for Smith to tap home, but the hosts leveled ten minutes later. Horsham restored their lead just before the break when a ball in by Tyrell Richardson-Brown found Harding at the back-post and he headed home. 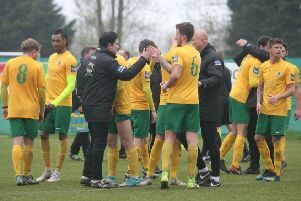 In the second half, Herne Bay again equalised again in the 54th minute, but Lavery secured the three point 12 minutes from time as he fired Horsham ahead for the third time. Horsham: Pelling, Metcalf, Miles, Shelley, Sparks, Brivio (Lovegrove 87), Hayward, O’Toole, Richardson-Brown (Lavery 72), Harding, Smith (Taylor 90). Unused: Hyde, Pearse.